Relieve tightness in hamstrings, hips and low back with this quick flow that can be done seated. Feel renewed and refreshed with this short flow that can be done at the office or home. Relieve tightness in the low back, hip and neck in this quick flow that can be done at your desk. Ignite your inner flame, your agni(fire) with this chakra element based class. Calm, peaceful, but strong flow using the chair as a prop. 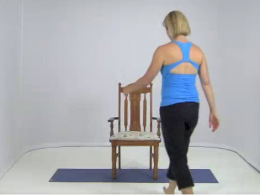 Strengthen your upper body safety in this slow moving class using the chair as a prop. Peaceful, calm flow to restore and renew body, mind and spirit. Restorative for body with a chair as a prop. Flow and move with breath connecting to movement. Slow moving flow for full body renewal. Embrace "who you are as you are" in this flow designed for women. Embrace your gratitude in this restorative flow. Move, breathe and flow in the upper body in this strong seated class. Calm flow perfect for all levels. Slow, strong flow perfect for all levels. Strengthen your upper body and focus on breath connecting to movement while remaining seated. Expand and open your heart in this peaceful strong flow. Feel yourself as a part of the world around us as you move through this strong flow. Perfect for students that are looking for an entirely seated flow that strengthens upper body. Learn the basic poses before you do your fist chair yoga class. Faster paced chair yoga class perfect for those ready to move into a stronger chair yoga class. Restore and renew your body in this peaceful flow. Learn the basic poses before you do your first class. All poses shown seated.